Last week, I wrote about how a black Wisconsin legislator, Representative Mandela Barnes, was ousted from Scott Walker's presidential campaign announcement event. I printed out my ticket. I cleaned up a bit and even raised my clothing game to business casual. Then I drove across Waukesha Monday to the Scott Walker campaign announcement extravaganza at the county fairgrounds. What happened once I made it to the first entrance and handed the ticket to a smiling young woman is both appalling and entirely predictable. The flow of people from the parking lot brought me to the entrance, a temporary shade tent where attendees were channeled by tables through three lines. The friendly woman scanned the code on my printout, said okay as it beeped recognition, and then called me back as she looked at the hand-held gizmo's screen. It's been rejected, she said in a surprised tone. Then she pointed me to the far row of tables to talk to another aide there. The young red-headed man named Nathan started punching at his pad and looking at the ticket. He wasn't resolving the rejection right away, asked for me email and then said this with his eyes on the pad: "Oh, did you sign the recall?" "Yes," I said. "Oh, that's it then" he replied. Others who had been behind me continued to pass through to the main building. Nathan, a cool cat for being in his early twenties, told me I could watch the proceedings from the overflow tent with the people who had no ticket or who got to the event later than me. I pushed him and then he would not make explicit that the rejection was given to any and all petition signers. As I say, my rejection is predictable. A similar, but funnier, denial happened to Democratic state assembly member Mandela Barnes. The careful managing of a TV bite's backdrop is par for the campaign course. I have gone to other events in the Waukesha area and seen Walker at least three other times, even chatted with his sons at a rope line once about Wauwatosa East High sports at the Country Springs Hotel. I am a former reporter and news junkie and would attend any event in my neighborhood that garners national attention. Since my neighborhood is Waukesha, though, these events tend to all be Republican deals. However, I am not surprised I did not get in to this Walker announcement Monday because now Scott is in the big time and the place was bristling with police and handlers. Not a huge deal, then, but I bring it up anyway because it is a good reminder, on the occasion of Walker's official entrance into the presidential race, about some of the core weaselisms of a sadly craven man. Sadly, Bert's experience isn't a solitary one. Walker's McCarthyism has been going on for years. Immediately after the recall election in 2012, Walker started retaliating against anyone and everyone who stood against him. As of the time of this writing, some of the first victims of the New McCarthyism includes Dane County Judge David Flanagan, who was the first judge to rule against the Jim Crow laws; UW staff and Regents; and Mary Lou Young and Linda McFerrin, officers at United Way of Greater Milwaukee. Even yours truly isn't immune from the harassment from the right. For the umpteenth time, someone has filed an Open Records Request against me with my employer. The requester wants to see if he can find more dirt on me from the acts of retaliation Scott Walker and his minions threw at me as well as to see if I'm qualified to do my job. I am not worried about this in the sense that they will find anything to discredit me or get me into trouble. But I do find it irritating that they will not cease in their harassment because they don't like that I speak the truth and keep exposing Scott Walker and his allies for the miscreants that they are. And yes, questioning my qualifications to do my job is nothing short of an act of harassment and retaliation. Walker even went so far as to withdraw the name of Joshua Inglett as his nomination to the University of Wisconsin Board of Regents, because he had signed the recall petition two years ago. There is a myriad of other stories of people being harassed, threatened and intimidated by Walker and his supporters for no other reason than they signed the recall petition. Whenever a person announces that they are running for an office at any level - even nonpartisan positions like judges or town councils - the first thing the Republicans do is run the name on the database to see if they signed the petition. If the person did, the Republicans will try to pin it on them like a scarlet letter. Richard Nixon's Enemies List had only 20 names on it. Walker's has nearly one million and counting on his Enemies List. It's McCarthyism on steroids. Let's just hope that we don't have to go through the embarrassment of another Nixonian presidency and Watergate (although Walkergate would be a highly appropriate name) before people realize that Walker is not fit for any office, especially not president. So if Walker would maintain his vindictive style of government, would any state that he did not win in the Presidential election need to suffer? I don't believe that Walker has never been on the ticket in a Presidential election year in Wisconsin. He has relied on low voter turnout for his success. In a high turnout election year Walker would most likely lose Wisconsin, which tends to vote for Democrats in Presidential elections. So if some people thought that electing Walker President would spare Wisconsin from more suffering, those people should think again. 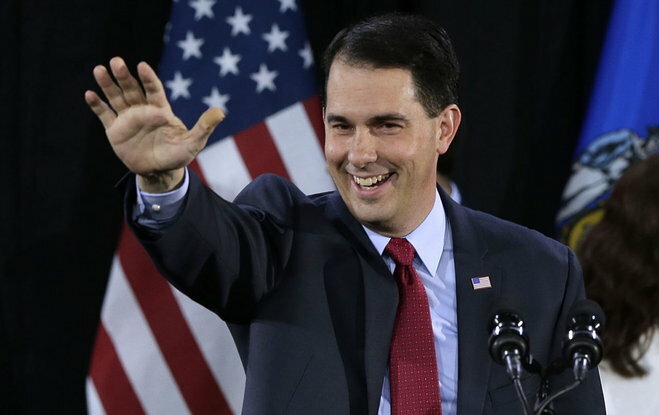 Vindictive Walker would probably cause Wisconsin to suffer even more as President than he can as Governor.